Managing money is an important life skill that can be taught to children at a young age. Do you give your kids an allowance? Are they always misplacing their money? Are you helping them learn how to save? Do they understand how a bank works? All of these things can be done and taught quite simply using the "family bank" concept and a simple money management worksheet. The basic idea is that parents act as the Family Bank, and each child keeps track of how much money they have in the bank using a worksheet like the ones below. Deposits and withdrawals are easy to handle, and when it comes time to give allowance, no cash needs to even exchange hands. The worksheets can be taped to the inside of a pantry door. We designed these worksheets to allow you to track up 4 separate "accounts" such as (1) Spending, (2) Tithing, (3) Savings and (4) College. Parents should keep track of how much the kids have in the family bank just in case the worksheets ever get lost (by updating notes on your phone or on a piece of paper in a file folder). For more details about how to use the worksheets, see below. The two free downloads below are PDF files that you can print as-is. So, if you don't have Excel or OpenOffice, you can simply download these printable versions. Save to OneDrive to edit in Excel Web App and Excel for iPad and iPhone! 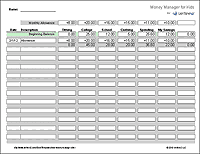 Download the Money Manager for Kids spreadsheet if you want to customize it or keep an electronic record. This is a simple Excel spreadsheet that was used to create both of the printable versions shown above. New (1/30/12): The Excel workbook now contains a landscape version that allows you to include more categories. I created this for our older children who will now be getting an allowance and will be required to budget and pay for their own clothes, school supplies, lunches, etc. This is something my parents had me do when I was growing up, and it taught me some good financial principles at an early age. Before you begin, you should read the blog article "Money Management for Kids - The Family Bank Approach". 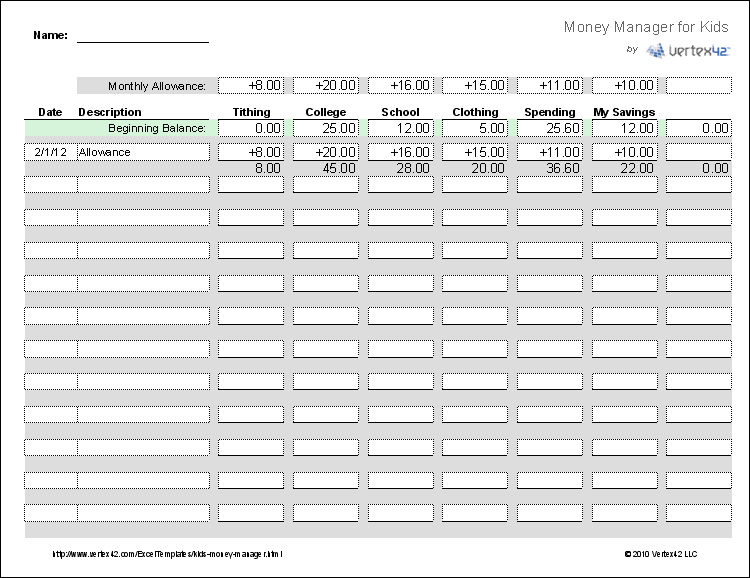 The image below shows an example of to fill out this money management worksheet. It's basically just a simple register ... except that it lets you keep track of up to four separate balances at once. The example below shows a case where Tommy is putting a portion of his allowance and other money into (1) Saving for college (2) General Savings, (3) Savings for a New Bike, and (4) Spending. Balances: The current balance for each "account" or column is entered into the rectangular boxes. It should be pretty obvious how it works if you take a look at the example above. Allowance: When you give an allowance, you don't have to give cash, you simply record the allowance as a deposit, divided up between tithing, savings, and/or spending. Notice that in the example above, the $5 allowance was split into all 4 columns. Deposits: If your child receives cash for work they've done or birthdays, they can hand you (the banker) the cash, and you record the deposit in the worksheet. Withdrawals: If your child needs cash for some reason, you hand them the money from your wallet or purse (i.e. the bank) and record the withdrawal in the worksheet. When you run out of space: After you've filled in a worksheet completely, you print out another blank copy and then record the current balances at the top of the new money manager worksheet. We got the idea to use the Family Bank approach from a family member who was already doing something similar for her kids. Previously, we were using the envelope approach, where you have a set of envelopes for each child's various spending money and savings. The problem was that we hardly ever had enough cash or small change on hand to handle breaking the amounts into the different envelopes. Also, we found that the kids were frequently losing the money, misplacing it, or simply giving it away (particularly the younger ones who could be easily manipulated by their older siblings). I created the above worksheets so that we could experiment with the Family Bank idea. So far, we are liking it a lot.